The month began with a 10k in my own backyard. Well, almost. I wonder how many times I’d literally have to run around my own back garden to knock out a total of 10 kilometres? At least 400 I reckon. It would get quite boring. Plus I’d wear the grass down and get told off by my wife. Luckily, however, the Ben’s Boring Back-Garden 10k wasn’t on the calendar, but the Middlesbrough 10k was. And it served as a warm up (literally, ‘cause it was hot as balls) for The Great North Run a week later. Fun was had dressed as Superman, running with Batman. Not the Batman, mind. That would just be stupid. 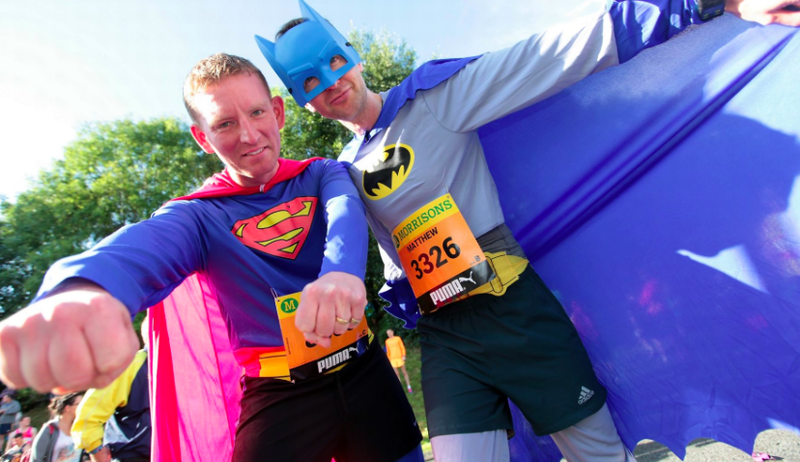 ‘That’s enough running for one month’ is what other, more sensible people might declare having just belted out 13.1 miles dressed in a crotch-hugging superhero outfit. But no. There was the small matter of two more half marathons to finish. Not one. But two. Firstly, The Scottish Half Marathon and associated amusement, then the Redcar Half Marathon. By the end of the month you could hear the clank of my finishers medals from space. I would imagine. Urgh, God. This was it. No escape. Well, unless I said ‘you know what, I’m not going to do this stupid effing marathon because I don’t want to and no one can make me’. But I didn’t do that. After all, I’d trained for it. Kind of. And besides, I was going to bag a sub-4-hour time. Surely. And I did. Just. And I can look back now and laugh at the point around 22 miles where I legitimately thought I might die. Because I didn’t die. And I’m never doing a marathon ever again. And I DO MEAN IT, THIS TIME. Amazingly, however, I didn’t just park ‘this running crap’ for the rest of the month/year despite the urge to do just that. I was out for 4.1 mile trot only 3 days after the end of the ol’ 26.2. And I kept on running after that, too. Not constantly, you understand. Like some sort of mental world record seeker. ‘Man runs continuously for 27 years’. The last race on the calendar for 2015 was the Newcastle Mo Run 10k moustache dash thing. I wasn’t really in the mood. It was almost like I’d done a ridiculous amount of running already this year and the body was rebelling. Still, I finished it for the love of the moustache-shaped medal. The month started with unseasonably high temperatures, but it wasn’t long before lashing rain and howling winds started to affect my willingness to head out of the front door with the Lycra on. Right, well, that’s enough blogging for one year as well. Thanks, as ever, for reading this nonsense. See you next year. This entry was posted in Reviews and tagged 10k, exercise, fitness, Great North Run, health, jogging, marathon, marathon training, scottish half marathon, yorkshire marathon. Bookmark the permalink. I’m really glad I discovered your blog, and look forward to continuing to read in the new year. Happy New Year! Thank you – you too!